The joint ACFA Physics and Detector Workshop and GDE meeting on Linear Collider (KILC12) will be held in Daegu, Korea, from 23 to 27 April 2012. The timing of the workshop is likely to be just after the first combined result on the Higgs particle by two LHC experiments, ATLAS and CMS, is announced at the spring conferences. On 13 December last year, a press conference was held at CERN announcing that they saw tantalising hints of the Higgs particle, though they were not conclusive. LHC physicists have been working hard to improve their analyses ever since, but the combined results that would be announced this spring will be based on essentially the same amount of data as last year. A significant increase of statistics would have to wait for the 2012 summer conferences. With an indication of the Higgs particle at around 125 GeV, however, the possible physics scenarios for the ILC are rapidly becoming concrete. Thus, one of the primary goals of the Daegu workshop is to clarify the physics mandate of the ILC corresponding to the narrowed-down physics scenarios. Before jumping into the ILC mandate, let us look at how significant the observed hints are for the Higgs particle. Suppose the Higgs particle did not exist. In this scenario, there is some probability that statistical fluctuation could result in an excess of events that may look like a Higgs signal. According to the updated reports by ATLAS and CMS, if the Higgs particle did not exist, the probability that the statistical fluctuation alone produces a Higgs signal anywhere between 110 GeV and 600 GeV that is more significant than the actually observed signals’ probabilities are 0.014 and 0.069 for ATLAS and CMS, respectively. Then, what is the combined probability of the two experiments? Here, one has to take into account that the two experiments observed an excess of events at the same Higgs mass around 125 GeV. That is, once one experiment sees a signal at a certain Higgs mass, another experiment can then focus on that mass. Even though the proper and official procedure for combining the two results will be presented soon, the combined number would be much less than the simple product of the above two probabilities. This is indeed a small number, but it is right for them to be conservative and not to claim a discovery yet. After all, this is the Higgs. Still, it seems to be reasonable for us to think about the physics mandate of the ILC assuming that the Higgs particle really exists there. The mass of Higgs where the excess was seen (that is, approximately 125 GeV) happens to be very interesting and optimal region where the ILC can perform a rich variety of physics studies. If the mass were larger, around 160 GeV, the Higgs would decay mostly to WW and ZZ, and it would be difficult to measure the decays to other final states where we can verify if the Higgs particles is the origin of mass. And, if the Higgs mass were lower, then the Higgs signal would become weak and it may not be discovered by the end of 2012, setting up a murky situation surrounding the Higgs particle that could persist for a few more years. Indeed, we have been working on the ILC in order to study ‘this’ Higgs particle, which can be observed in one day of data-taking at the ILC while it takes about a year at the LHC. The figure shows the physics topics to be studied by the ILC in the scenarios that the Higgs particle is light (around 125 GeV) and that nature chooses supersymmetry to exist. 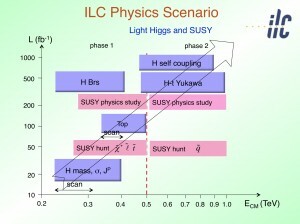 The topics shown in blue belong to the Standard Model, and they, if the Higgs is light, are mostly guaranteed for the ILC. The ones shown in pink are those of the supersymmetry, and they may not exist or may be replaced by other new physics such as models with extra dimensions. As mentioned in the previous research directors’ reports (20 October 2011 by Sakue Yamada and 17 November 2011 by Michael Peskin), it is important to note here that the Higgs particle is not just another new particle: its field fills the vacuum of the universe, giving mass to all massive elementary particles of the Standard Model, and it embodies a serious inconsistency of the Standard Model that requires that some new physics should exist in the Terascale. Many new physics models would lead to Higgs properties that delicately deviate from those of the Standard Model with patterns specific to the models, and precision measurements of the Higgs particle is likely to point to the correct physics. At the KILC12 workshop, a large part of the afternoon of the opening day is dedicated to the LHC results and their implications for the ILC, and a panel discussion is planned later in the workshop. Lively exchanges of opinions are expected. The workshop has other important benchmarks: the outline of the detailed baseline design of the ILC physics and detector efforts will be presented to the International Detector Advisory Group, and the accelerator baseline will finally be announced after intense optimisation efforts. 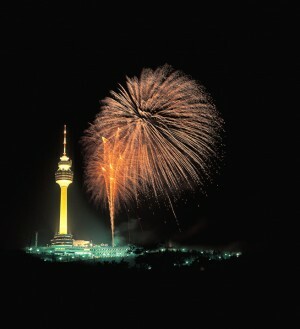 Late April is a nice season in Korea and participants can also enjoy excursions to nearby historic sites. See you all soon in Daegu!